1st of the month – the day to donate £1 to 1st Class ME Research! On the 1st of each month the ‘Pound Hound’ barks at my bedside to remind Me to remind You of the ‘One Day – One Pound’ Fundraiser. 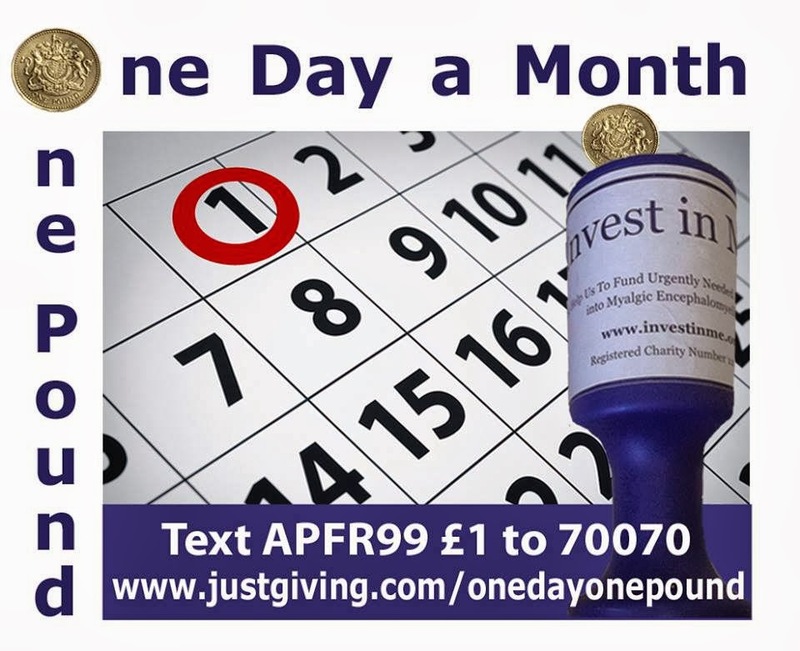 Ruth’s idea of One Day – One Pound is for as many people as possible to donate just £1 on the 1st of each month to show support and to help raise the much needed funds for 1st class biomedical research into this extremely debilitating and often devastating illness. Don’t worry if you miss the 1st – all donations throughout each month will count. Gift Aid is an extra 25% of your donation from the government if you are a UK tax-payer, so don’t forget to tick the Gift Aid box when you donate if this applies to you. To donate £1 by text to 70070 – use the code APFR99 followed by the amount £1 (or £2, £3, £4, £5, £10 if you wish). Text donations will appear on the Just Giving Page and you can choose to add your name and Gift Aid if eligible, by text. You can also donate (worldwide) from a minimum of £2 via the JustGiving page. Other options to donate £1 or more .. Please share, tweet, forward this link to your email contacts and ask them to spread the word that if anyone would like to donate £1.00 or more on the 1st of each month it would be much appreciated by the estimated 250,000 sufferers in the UK alone and millions worldwide. Invest in ME Research is run entirely by unpaid volunteers who either have ME or are parents and carers of ME patients. They are driving the agenda of scientific biomedical research into diagnostic tests and treatments for myalgic encephomyelitis in UK in collaboration with international researchers of world renown. 2015 marks the 10th year of amazing progress made by this small charity with a BIG cause – will you help them make it the best yet? Let’s Do It for Invest in ME Research!